It's time for the latest Sweet Stop Sketch. Here is what I was inspired to create with this sketch. I loved having that text panel on the sketch this week! It made it super easy to create with. Just find a sentiment or scripture that you love and waa-laa!- the hard part is done. I opted to use patterned paper instead of attempting to stamp my own background and that was mostly because I was just dying to use this patterned paper I've had in my stash for awhile. I am also entering this card into the Stampin' Sister's in Christ challenge for this week: All Things Beautiful. 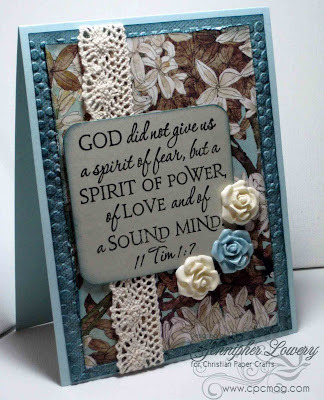 The beautiful things I used on my card are the Blossomwood patterned paper, crochet lace, Vintage Flower Adornments and of course God's Word is always beautiful. I really like that sketch, but OMGoodness, your card is SENSATIONAL!! Just lovely. Yes, that patterned paper is so pretty and your sentiment is just wonderful. Your card is just stunning! I just love everything about it, from the scripture being the focal point and then the beautiful lace ribbon, embossing, colors and paper, see everything. Love it. Have a great weekend. Beautiful! I love the scripture and that detailed background paper is gorgeous! I really need to find some of those flowers....so pretty! This is so beautiful!! The paper looks so pretty with the blue. Just gorgeous!! Your card is gorgeous! I love, love, love these colors together. Did you see you were the winner on my blog for the Sentimental Sundays blog hop? Stop by my blog or the SS blog for details on your prize. Gorgeous, classy colors! LOVE this card, Jennipher! Gorgeous vintage card! I love those rose adornments. Very pretty! Love your flower embellies! Have a great week! Thank you so much for following my blog. I really appreciate it :D Following you back. Your cards are AMAZING. I browsed some of them and really like them. I, specially, LOVE this one. So pretty. Oh WOW!!! This is so beautiful!! The colors are amazing and I love the lace and flowers! Gorgeous card!!! !